Why? Why give this away? view of commodity futures skews. a particular choice of model paradigm, model type, day counting convention and so on. models under many different popular choices of model particulars. 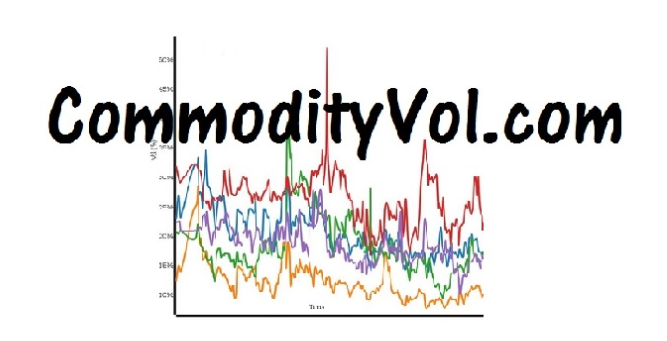 CommodityVol.com is offered as a teaching tool to the option trading public. see all of the neat aspects of option trading. All information provided on an "as is/where is" basis for informational/academic purposes only, not intended for trading purposes or advice. Neither CommodityVol.com nor any of its independent providers are liable for any informational errors, incompleteness, or delays, or for any actions taken in reliance on information contained herein. By accessing CommodityVol.com, you agree not to redistribute the information found therein. CommodityVol.com is intended for an audience who deals with Commodity Skews on daily basis and is familiar with the terms and shortcomings of the results presented here. All data presented here is owned by its respective exchange. Nothing on this site should be construed as infringement of the copywrights of the respective exchanges. We are operating as a news reporting agency under the exemptions granted by US Law. Pursuant to 17 U.S. Code § 107, certain uses of copyrighted material "for purposes such as criticism, comment, news reporting, teaching (including multiple copies for classroom use), scholarship, or research, is not an infringement of copyright."